Makes a copy of another checkbox. Creates a new check box widget. The returned size includes the text next to the radio button. When textures are loaded, the height of the checked image is used (in case the check goes outside of the box). When using textures and the checked texture is larger than the unchecked one (when the check mark leaves the box) then this function will return (0, -heightDiff), otherwise (0,0) is returned. checked Should the check box be checked? 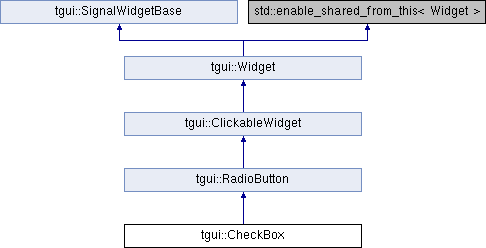 This function is overriden because the RadioButton implementation also unchecks neighbor radio buttons.